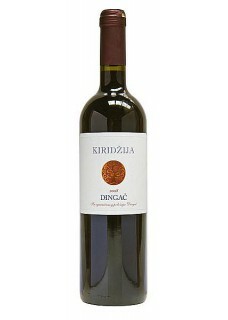 Kiridžija Dingač is simply one of the finest to be found. The subtlety of the wine is immaculate. Lots of dark berries like blackberry, even some dried fruit like figs going on, very balanced aromas. Aged in Hungarian oak barrels that Vedran is using which set his wines apart from the standard Slavonian or French barrels used by others. The body is succulent and you really want to keep it on your palate as long as you can. Over the oak there also emerges some nicely subtle, sweet berry flavors. Lots of tannins, good tart red fruits, acidity is in place. Croatia in a bottle, you can see the Adriatic shimmering in the hot sun when you close your eyes. An excellent example of Plavac Mali! Food pairing: Roasted and spiced meat dishes, stews made of oilier fish, mature cheeses, veal.